Thank you for a great event! Check back soon for 2019 event info. It's back and bigger and better than ever! Because we had such a blast last year, we decided to double the fun and spread the joy of #QtWS18 across the pond. Join us for two days of Qt training, insightful keynotes, development topics for embedded, desktop, mobile devices, and more. Subscribe now and stay tuned for updates! Qt World Summit is yet again set to change the way you think about software development and user experience on embedded, mobile and desktop. Be ready to have your mind blown by our impactful, impressive and insightful keynotes, presentations, and Training Day courses. In the 39 years, he's been in the tech field, he's worked with hundreds of organizations, written two books, published hundreds of articles and podcasts, and tours the world speaking to audiences everywhere. When he can, he does his laundry in Andover, Massachusetts. Rashmi is an award winning technologist and leader with over 20+ years of experience. Rashmi is currently Head of Advanced Engineering and User Experience, responsible for technology and go-to market strategy to drive breakthrough user experiences into new pursuits and product platforms. She is focused on combining cutting-edge technologies with advanced UX design and human-machine interactions. She has over 20+ years of technology and leadership experience and was most recently at Apple Inc, focused on Technology and Strategy for iPhones. Rashmi has held roles such as Director of Technology at Tandem Launch Technologies, Technology Lead at Qualcomm, and has worked on developing MEMS and nanotechnology-based sensors at GE Global Research Center in New York. Rashmi also worked with Nobel Laureate Dr. Alan MacDiarmid on developing carbon-nanotube-based sensors. She is a very active member of the Society of Information Displays (SID) and has had many roles of increasing responsibilities at SID, being instrumental in shaping the display industry. While acting as the Chair for the Silicon Valley chapter the SID membership base grew by over 20%. Rashmi is the General Chair for Display Week Conference 2019. Rashmi is an active advocate of STEM education. While at Qualcomm she co-founded QWISE: Qualcomm Women in Science and Engineering. She continues to promote her passion as a female engineer through HARMAN's partnership with Square One Education Network and 1000 Dreams Scholarship advocating STEM education. She was recently awarded Diversity Journ's "Women Worth Watching in STEM" 2017 award. She was also recently inducted into the prestigious "Women in Technology Hall of Fame" by WITI in 2018. Given Rashmi's experience on both Automotive and Hi-Tech she is being the bridge between Detroit and Silicon Valley. Dr. Johnston has 25+ years' experience designing and developing complex software system and 15+ years' experience working in regulated medical software development. Much of this experience has be focused on UI design and Human Factors aspects of Class II and Class III medical device programs. Most recently Bruce has been providing strategic insight to a variety of clients on the intersection of modern software development methodologies, including HF/Usability and Agile practices, and the regulated medical environment. Bruce first used Qt tools for UI development in 2006 and has worked with the Qt tools on a number of projects since. Medical software adds the important dimension of safety to an already difficult landscape facing software developers. Problems with medical software products and devices contribute to thousands of injuries and deaths each year, therefore representing the single most important issue to consider for medical software development. This risk of harm and the corresponding need to deal with the regulatory agencies that have been put in place for medical products can be intimidating. The result is often overly proscriptive, bureaucratic processes that drive up budgets and drive out schedules. But medical software development need not be intimidating. It can be approached pragmatically by first gaining an understanding of the risks a product presents and then building a development process tailored to those risks. Industry-standard best practices can then be applied to ensure the risks are adequately addressed to ensure a safe and effective product. The FDA guidance on usability provides an example of how the regulatory process can prompt developers to think beyond their immediate environment and help drive the development of better, safer software. Euan Cameron is responsible for Developer Technology at Esri and views a well-designed API as valuable as any work of art. Euan has worked in the geospatial software industry for over 30 years and continues to have fun innovating with maps and technology. Euan is an outdoor enthusiast and can often be found in the Sierra Nevada Mountains climbing, skiing, or hiking. Mykhaylo (Michael in German/English) Chayka was born and studying in Ukraine, holding M.Sc. degree in Computer Science. From 2015 he has been living and working in Germany, have 12 years of experience in Software Development where 7 last years are in Automotive. He joined MBition/Daimler Family in July 2018. The Daimler Group is one of the biggest producers of premium cars and the world's biggest manufacturer of commercial vehicles with a global reach. Murat Günak is an extremely accomplished automotive designer with broad interests and deep cultural insights. A keen knowledge in technology and future developments, in special in (electric) mobility combined naturally with appreciation of painters like Matisse or Picasso and a lasting interest in opera and works as stage designer and author of children theater plays. Among his many career stations were Head of Design in the Volkswagen Group and Mercedes, or being responsible for all Peugeot passenger car designs for over 5 years. To keep things short: it is fair to say he has had a significant hand in shaping European automotive design. You can observe his personal touch particularly in the iconic Mercedes-Benz SLK-Class R170, the W202, the first 4 door coupé CLS, the icon Peugeot 206 or the classic 2009 VW Passat CC. Fabrizio Monaco is the product manager responsible for the TomTom automotive HMI, the embedded navigation application developed since 2014 using the QT framework and currently running on multiple car brands. He has extensive experience in working both with development teams and UX designers, aligning design choices with the TomTom product's value proposition. Fabrizio graduated in computer engineering and holds a master degree from the Polytechnic University of Turin (Italy). As Global Marketing Manager IPC, the intent is to empower engineers to make future-proof machines that are better, faster and safer – while at the same time giving them the freedom and flexibility to explore the opportunities provided by modern technologies. I get energy from networking with inspirational people – and by using my own experience to inspire others. My experience in technology, business management and marketing & communications are key ingredients in what I do, and they impact on every decision that I make. Activate your imagination. This talk of Michel Min is about Omron's aim to improve the relationship between machines and humans and how rallying with a ping pong robot contribute to this. Michel will provide insides how Omron make the connection from ping pong rallies to concrete steps towards the future of manufacturing sites where the machines are self-aware, understand people’s intentions and cooperate. Revitalizing the manufacturing industry: how very Omron. Continuing the tradition of combining training with the Qt World Summit conference, the Training Day takes place again this year before the Conference Day. The Training Day is hosted by our training partners ICS and KDAB in Boston and KDAB in Berlin. See the full course list for Boston. The courses for Berlin will be announced soon. No matter how you slice it, you can have the fanciest tech out there, but at the end of the day, user experience will define your success. 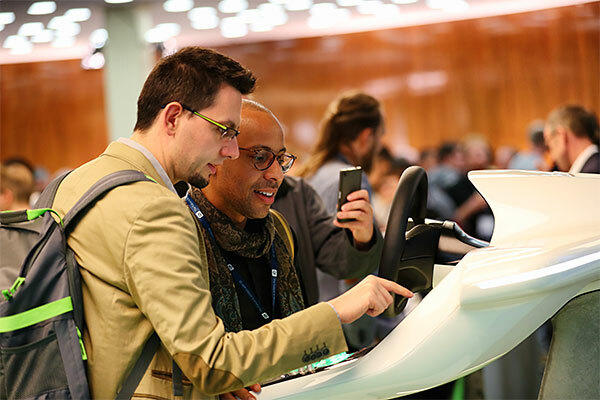 Join #QtWS18 and witness the impact of UX in projects across different sectors. Learn how Qt can help you achieve a superior user experience and a faster time-to-market with tools that make work fun and easy for both designers and developers. Relive the highlights of last year's Qt World Summit in Berlin, Germany. Have a look at our recap video and some of our 2017 keynotes below. Alex Hilliger from Daimler talked about Rapid UI/UX prototyping of a show car. Alex heads the Advanced Graphics and Rendering team at Mercedes-Benz Research and Development in the Silicon Valley. Linda is the author and illustrator of Hello Ruby, a children’s picture book about the whimsical world of computers. In her popular talk she addressed among others the question on how we prepare our kids for a world where more and more of the problems around us look like computers. Mr. Tanabe is CEO for Panasonic ITS and heads the Development center which has SW, HW and Mechanical section. His talk was about Future of Vehicle HMI Systems. Dr. Steven Goldfarb is a physicist from the University of Melbourne working on the ATLAS Experiment on the Large Hadron Collider at CERN. Watch his thought-provoking presentation called How Do You Measure What You Can’t See? Twice the Qt World Summit, double the fun! For the first time, we have added Boston as a second location for #QtWS18. This year, we'll talk among other things about how Qt will bring developers and designers closer together to create an even better user experience, so better get used to experience Qt World Summit – twice! Subscribe to #QtWS18 newsletter to receive updates on ticket sales start, speakers, training topics and other updates. Go to the Qt World Summit main page and click the register button or link. The contract terms (“Terms”) between The Qt Company Oy, having its registered address at Bertel Jungin Aukio D3A, 02600 Espoo, Finland (“The Qt Company”) and you as the customer (“Customer”) commences upon the confirmation of Customer’s booking via Eventbrite to the event called Qt World Summit (“Event”) by The Qt Company. The booking information by the Customer should contain at least the following data: company name, the participating person’s job title / function and relevant contact details e.g. email address and mobile number. The Customer will not be permitted to participate to the Event if the full payment by the Customer has not been received by the Qt Company. Cancellations received by email address qtws@qt.io on or before October 31, 2018 by 5:00 pm CET, will receive full credit of 100% paid registration fees. No refunds or credits will be issued after October 31, 2018. The Customer may transfer his/her registration to another person until seventy two (72) hours of Customer´s scheduled arrival date by providing authorization to The Qt Company by email at qtws@qt.io Personal data of The Qt Company’s customers is stored and processed according to the Act on the Protection of Privacy in Electronic Communications. Customers that do not agree with this should contact The Qt Company in writing immediately by email address qtws@qt.io . The Customer confirms that he/she has agreed that all customer data is stored in the database of The Qt Company, and The Qt Company shall have the right to use Customer’s job function, company name and logo in The Qt Company’s promotional materials for future editions of the Event and services related to the Event. By signing the registration form, the Customer agrees to allow (i) all photos, video and audio recordings done by The Qt Company or its co-operators at the Event and (ii) the free usage of such recordings for promotional purposes by the Qt Company, at its sole discretion. The Qt Company reserves all copyright and other intellectual property rights relating to the Event name, Event brochure, Event program and to all other Event related documentation and marketing materials. It may be necessary for reasons beyond the control of The Qt Company to change the content or timing of the Event or exchange individual speakers, at the sole discretion of The Qt Company. The Qt Company bears no responsibility or liability of any kind if it is necessary to exchange, cancel, modify or postpone the Event due to an unforeseen severe incident. The aforementioned shall include, but not limited to: armed conflict, civil unrest, terrorist threats, natural disasters, political constraints, significant influence on transport and so on. If the Customer fails to pay the amount in full within the time frame set above and in the invoice, The Qt Company reserves the right to cancel the Customer’s participation and/or release the contracted exhibit space in the Event and The Qt Company is free to provide the said space to other Customers, at the sole discretion of The Qt Company. In the unlikely scenario that The Qt Company would be required to cancel the Event, all payments received will be credited to an upcoming future event within a year of the original Event. Should the Event be postponed, The Qt Company will transfer the payment to the new date. Should one or more provisions of these terms or the contract be or become invalid, the remaining provisions shall nevertheless remain valid. The invalid or unenforceable provision will become replaced by a valid provision that the intent and purpose of the original provision as closely as possible. These Terms shall be governed by the laws of Finland. Any dispute, controversy or claim arising out of or relating to the agreement, or the breach, termination or validity thereof shall be finally settled by arbitration in accordance with the Arbitration Rules of the Central Chamber of Commerce of Finland. A dispute shall be resolved by a sole arbitrator. Notwithstanding the preceding sentences, claims for non-payment of monetary charges may be resolved in the district court of the respondent’s place of domicile if the respondent does not contest its payment obligation. If the parties so agree in writing, any dispute, controversy or claim arising out of the agreement shall be resolved in the district court.